The theme of the show is waiting and is linked to migration. The overall aim is to create greater understanding of people’s different living conditions and that despite our differences, we are more alike than different. 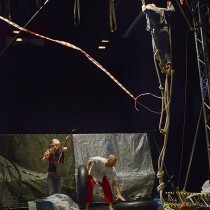 The production is an cooperation between the Circus Glass Royale and Circus Arts. Three people in one place. They are waiting to travel. They have not arrived yet. They have not landed yet. They do not know what will happen next. They are in Limbo. What do they do while waiting? They play. They are arguing. They are laughing. They mourn. They sing. They live. 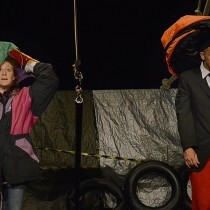 The show relates to the theme of waiting on several levels. It is a story of people fleeing in anticipation of getting on to a better life. But it is also a story of becoming an adault, to leave behind the child who knows only play and becoming aware of the outside world.